The Sun’s nearest neighbors do not share a similar chemical composition. Each star in the chart is quite different from the Sun and from its neighbors. Ross 248 is a red dwarf star, while Sirius A is a main sequence star two times the Sun’s mass. 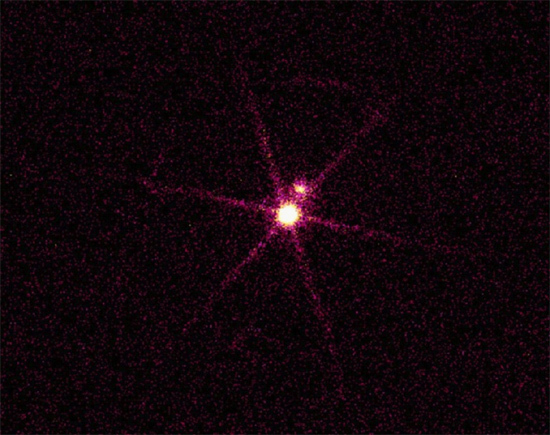 Although a few stars share the red dwarf designation with Proxima Centauri and Ross 248, they are unique in their spectral signatures. Various elements in their spectrograms are distributed differently in each one. Why the stars should be so unalike is a mystery to astronomers because all the stars, including the Sun, should have been born from the same mix of elements in a nebular cloud. The prevailing theory is that the Universe formed out of the largest structures imaginable: tremendous clouds and sheets containing millions of galaxies that broke up into the smaller dusty clouds, which then became individual galaxies. The Milky Way galaxy is currently thought to contain almost a trillion stars in orbit around a common center of gravity. According to present understanding, it is theorized to have condensed out of a cloud of hydrogen and dust several thousands of light-years in extent, with a more-or-less homogeneous blend throughout—only minor variations in its elemental composition are supposed to have existed. Hydrogen, helium, and some trace elements organized into a great whirlpool-like structure that started spiraling inward due to gravitational influence. First the nucleus appeared. As the gas and dust continued to condense, eddies formed in the gravitational vortex in the shapes of great whorls, crushing the material together into extremely hot, dense spheres. When the temperature and pressure reached a critical point, hydrogen fusion reactions ignited at the cores of the new stellar orbs and the galactic disk began to shine. Because the initial cloud was theoretically undifferentiated overall, other stars in proximity to the Sun should all be cut from the same cloth and contain similar chemical constituents. Surveys out to hundreds of light-years, encompassing the nearest 6000 stars, reveal that they are all different from one another: some with more helium than their ages will allow, some with more iron than they should have, and other compositional oddities that could not previously be explained. Stars are said to age according to a well-established process that involves the consumption of hydrogen fuel in fusion reactions, creating ever heavier elements until the nuclear fuel is exhausted through radiative output. The star then implodes, throwing off its outer layers. More massive stars are said to collapse into neutron stars, while stars that are less massive gradually darken into cool, red shadows of their former glory. Therefore, a star’s age is theoretically determined by its temperature and luminosity, so the Sun’s stellar companions are all thought to be different ages. In fact, they are supposed to vary in age to such an extent that astronomers think they were not even born in the same place or at the same time. The proposed solution is that the spiral arms of the Milky Way appear and disappear as it changes over the eons of its existence. Stars like the Sun take about a million years to complete one revolution around the center of the galaxy, and during that time they might have felt a push or a pull from one or another of the arms. If the spiral arm happened to be ahead of the star at a close enough distance, then it might have imparted a gravitational pull, accelerating it into a higher, more elongated orbit farther away from the galactic center of gravity. Conversely, if the star travelled ahead of a spiral arm, it might have been pulled from behind into a lower orbit. Previous Picture of the Day articles have taken exception to most of the theories set forth by consensus astronomy. Galactic and stellar evolution due to accretion and gravity-only models of compaction, thermonuclear furnaces in stellar cores, age-relevant data compiled from stellar brightness and color, and gravitational acceleration by congregations of loose-knit spiral arms have all been vigorously opposed by Electric Universe physicist Wal Thornhill’s electric explanation of stars and galaxies. According to consensus theory, the “stellar main sequence” is a chart of what happens to stars over long periods of time. No information about the electrical input or output of stars is considered when the various conventional theories are debated. By not bringing the electrical interaction of stars with their galactic environment into the picture, an entire line of investigation is never considered. Astronomers and other specialists are not mapping the electric charge flowing through space in order to determine its influence on stellar evolution. Because of that oversight, they constantly overstate the gravitational model of the cosmos. Retired professor Dr. Donald Scott wrote that the absolute brightness of a star depends on the strength of the current density impinging into its surface, along with the star’s diameter. As current density increases the star becomes hotter and brighter, glowing bluer and whiter. If the current flow into the star decreases, the star becomes red and cools down. So using magnitude and color to determine a star’s age is a false premise. Anthony Peratt, in his particle-in-cell simulations of plasma reactions, has demonstrated that galaxies are not formed by rarified wisps of gas and dust gradually falling into their own gravity wells. His models of galactic evolution reveal that electrically conductive plasma is able to create the shapes of spiral galaxies without resorting to gravity-specific influences. Peratt’s work with high-energy electric discharges indicates that the composition of stars in galaxy evolution is due not to where they were born, but to how they were born. In plasma cosmology and cosmogony, the stars are created in the compression zones of galaxy-spanning Birkeland currents. Such currents actually draw charged material along their filaments from across vast distances in space. As two (or more) filaments begin to twist around one another because of the long-range attractive force, the z-pinch effect crushes the interstellar plasma into galaxy-shaped masses. In consideration of the work done by Wal Thornhill, Donald Scott, and Anthony Peratt, the variations in stellar chemistry as well as their velocity differences are more probably explained by the plasma hypothesis. It is the electrical forces active in space and not the gravitational shuffling of locations that causes the differences among the stars.